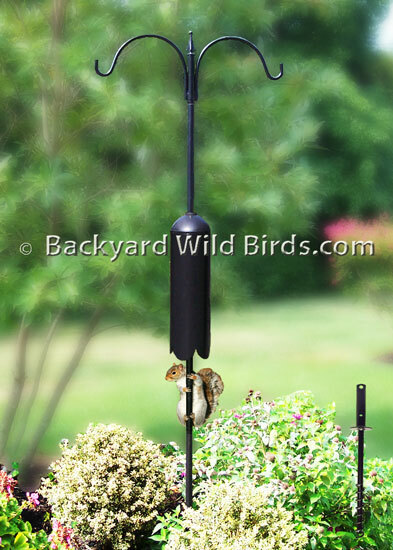 This Bird Feeder Pole is a popular Squirrel Proof Bird Feeder Pole system. Unique Bird Feeder Pole makes bird feeders hung above its squirrel baffle squirrel proof. It comes with two bird feeder hanger arms, a black cylinder squirrel baffle and a twister ground socket. Stop squirrels by mounting the pole about 8ft away from objects and the squirrel stopper baffle does the rest. The tubular steel pole has a 1 in. diameter and comes in three pieces. 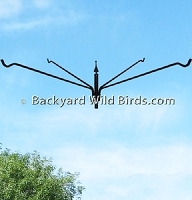 The double hanger arm is 1/2" round steel rod and has a 12" reach on each arm. It is approx. 7 ft above ground. The 20 in. ground socket has 1/2" turning holes to twist in place. Its finish is black semi-gloss, rust resistant, powder coat. Stop those squirrels from raiding your bird feeders today! (Tip: At the 2" tapered end of pole sections, apply 2 wraps of 2" or 1" white masking tape for a snug fit!) See our other "Bird Feeder Pole Systems" for examples of bird feeder ideas and also our best in class "Bird Feeders" to complete your bird sanctuary!